The images shown above are greatly reduced. Not all are shown. 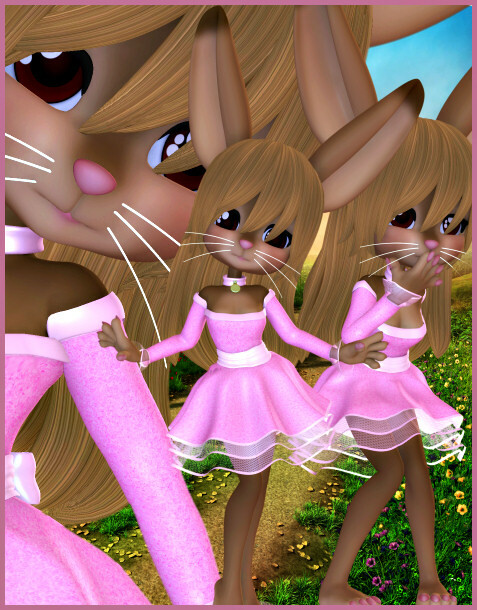 Some super cute bunnies for your Easter themed design projects. Peach Bunny Tubes for your Easter creations. These rabbits aren’t just for Easter. You can use them all year long for countless designs. They’re simply adorable and come in a pale shade, a brown shade, and a darker, almost goth, shade, to represent a snow shoe hare. They were made from a new model, called “Peach,” and you’ll be seeing a lot more of her in her many incarnations. There are 41 royalty free, high-quality clip art PSP images in this package. All of these graphics have transparent backgrounds, making it easy for you to use them as tubes or nozzles–or merely to drop into your design. The size of these images varies but most are 1000 X 2100 . All are 300 DPI, making them great for print projects. They can be used for personal or commercial projects, including web design, template design, candy wrappers, scrapbooking, etc. This package is one zip file, which is approximately 54 MB.